The list is endless. It has been a full, rich summer full of beautiful moments. What great photos and summer memories!! Now that's enough to make you smile! i guess you've every reason to put up your big smile. love the mosaic. great job Alicia. I love love fall! Thanks for sharing all these great photos! I'd have to say you crammed a lot into the summer. It's always a sad time seeing it go. Hope you'll stop by again this week. Goodbye to summer! I'm happy/sad to see you go! I'm all about sayin' goodbye to summer! Bring on the fall!! Great photo collage. What great pictures - though it is a little sad to be saying good-bye to summer. PS your blog is super super wide these days, it falls off the edge of my computer screen! Loving this! It's hard to believe it all happened over the summer. I agree! And I've loved 3 months of no socks to wash or match-up at the end of the wash, now with the tennis shoes and socks every day for my 3 kids, laundry is a bit more difficult! What a bitter sweet post! I love summer and all the freedom and fun it brings, but there is nothing like fall and the beauty and excitment I feel! What an awesome collage! I love the frog on the nose. I would freak! LOL We haven't found many snakes this year. My boys love catching them. I can see that you had a wonderful summer. Great collection of fun summer photos. It's sad to say goodbye to summer, though. Thanks for the linky! Happy WW! I hope you'll all join me for a new photography game on my blog launching this Saturday called Foto Finish. If you like showcasing your photography, you'll love Foto Finish! Mr Linky won't disappoint, I promise. Fall *is* my favorite time of year, but summer holds a special place in my lil ole heart. GREAT picture collage! Thanks Alicia! I entered my link again. It's not OFFICIALLY over for a couple more weeks though so I'm soaking in the last bits... ;) Love your collage. Love your collage! Looks like a fun summer. Funny that one of the things I like about where I live (on the West Coast of Canada) is that we don't have distinct seasons. I don't miss winter one bit. I'm so glad you enjoy where you live. You always amaze me. This looks so cool! What beautiful photos, so many memories to cherish, and now another season's to create! Love it! What a great collage! Our temps dropped over night & stayed! fall came in with a rush! Amazing summer memories! I can see the love in such a fabulous collage, it's a fantastic gift to your family! Happy WW! Love the layout of photos! Happy WW! Gorgeous, Alicia!! I'm missing summer already. Thought I'd do a little flashback too!! Very cool collage! Lots of fun! I love your collage, what a wonderful idea! I love layouts with lots of photos! Great way to document summer. What a fun summer, huh!?! Can't wait to see all that fall holds for you! Love the collage. I'm just learning to make them and was really happy with this one: Apple Picking. What a great summer collage you put together! Looks like you and your family had some great family memories this summer! Love the collage- my eye keeps being drawn to that bright watermelon photo! I love summer but I may even love fall more. Here's to cooler weather! What a beautiful conglomeration of pictures. A great way to celebrate the end to a wonderful summer! I make it a point to appreciate every season. Except for winter. I've given it a fair shot I think, but it's ruined things for me every year since we left California and moved to Maryland. Winter and I just don't see eye to eye! Hope you enter my photo contest, you have so many perfect shots for it! Great collage. I did a summer review this week too. I'm going to miss summer too. Gorgeous collage of summer! I'm ready, however, for summer to go bye-bye! You've had one of the most active summers ever! You really know how to enjoy life and THAT is how we should all live! Good for you LISH! I LOVE this idea! I'm going to have to try it! This is just too perfect!! What a great way to say goodbye to summer! I love the collage!! What a wonderful summer you had! OH Lyd and I are still in the summer mode for a few more weeks. so I can not bid-a-du yet.,lol. Looks like you all had a great summer. Love the collage! I am so going to miss a lot of the best of summer! I love this. It's like a beautiful buffet for me. Even if I'm not part of it this week, look at the choices I have!! what a creative collage and a great idea - hard to believe it's over but again I love the fall. Sorry I cannot participate in this weeks WW but you will understand why after reading todays post. hope to be back next week to join you! Looks like an amazing summer!! I love the collage! I am really excited for fall but I am sad that summer is over! Over here in the North East, we never know what to expect.Like they say. In New England if you don't like the weather just wait a minute it will change. beautiful photo collage! Summer is always so hard to say goodbye too! Good thing fall is full of color and fun too! Love that collage! What a fun filled summer you had! 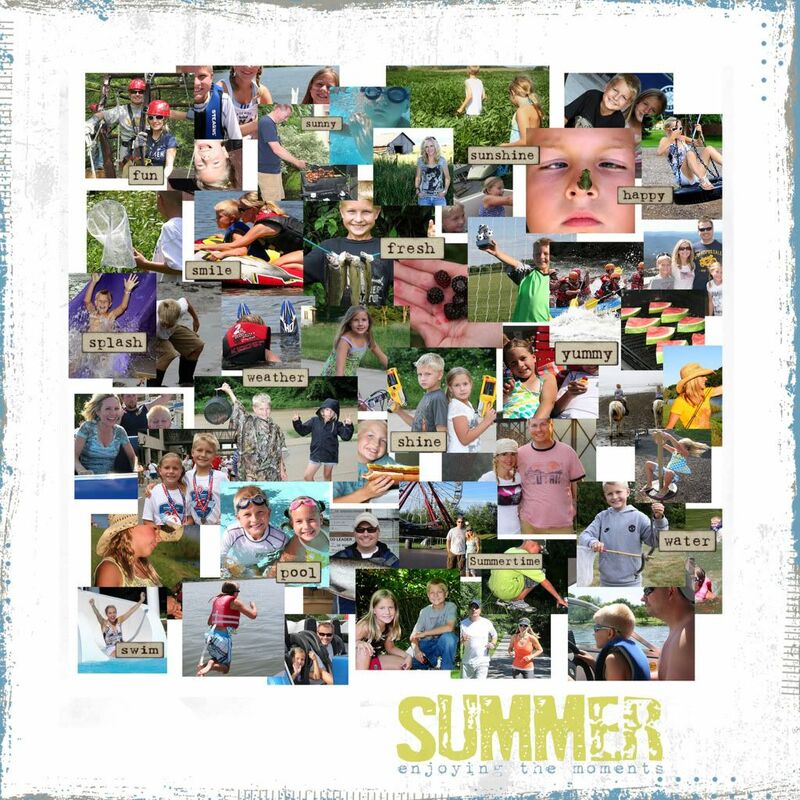 Love your summer collage - what a great memory record of your summer 2010! I'm glad that we're saying goodbye to summer. I can't wait for cooler fall weather! WOW WOW WOW! That collage is fabulous! I am thoroughly impressed! Ahhh Fond farewells! Leaving you is such sweet sorrow, but I like Fall just as much cuz I'm a holiday kinda person! Love them all. I already follow you, so I stopped by to say hello. So HELLO! Looks like a great great summer! But I love that collage you made! You are a talented digital scrapper! You know...I'm going to miss Summer for sure...but I'm REALLY looking forward to Fall! I loved the summer this year!Happy to see fall though. As much as I love and look forward to Fall, it's always sad to say goodbye to summer. Fall is my favorite...even when it hasn't been 100 degrees all summer. Love that collage by the way. Wish I was that talented! Love your tribute to the summer. My 9 year daughter sent out an email today to the family captioned - look at all the fun we had this summer. She pulled this great collection of pictures from my husbands photo library. My poor family never gets enough pictures from me so they were thrilled, lol. It's a great idea to celebrate before you move on to the next great season! Thanks for sharing. fantastic fantastic fantastic - I loved everything about this entry!